OK, my last post was about bandwidth hogs. This one is about groundhogs. I’ve just moved to Ann Arbor, Michigan to take a new job at the University of Michigan. Here is a quick episodic diary of my first few days with our new house. Episode #1. 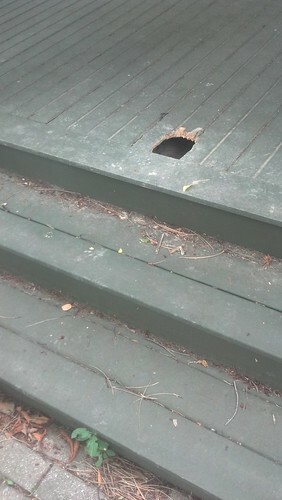 Our home inspector reports that when he arrived at our new house there were two groundhogs “frolicking” on the lawn. We don’t have groundhogs where we are from. We’re not sure what to make of this news. Episode #2. Our home inspector shows us a large hole that has been chewed through the front porch with bits of fur caught on the edge. There are a lot of little footprints leading up to the hole. We are concerned. Episode #2-a. It turns out that groundhog, woodchuck, whistle-pig, and land-beaver are all synonyms. Episode #3. The home inspector’s report is finished. 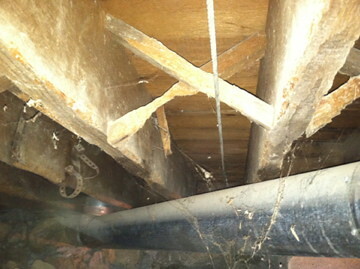 It includes a photo that shows something has been in our crawlspace, chewing on the underside of our floor. In addition, there is a groundhog-sized tunnel leading through our stone (!) foundation wall nearby, undermining our foundation. The inspector comments that this area looks like a “critter dining room.” We are concerned. Something should be done, but what? Episode #3-a. An Internet search reveals a variety of improbable folk remedies, like filling groundhog holes with cat poop. We are dubious. Where would we get enough cat poop? Episode #3-b. Having big holes full of cat poop all around your house seems worse than having a groundhog. Episode #4. After moving in, we found two medium-sized Havahart traps already in the house. One came with a squirrel’s corpse still inside it… so we know they work. Spouse reads on the Web that groundhogs love cantaloupe. A quick run to the grocery store and the two traps are baited and set. Episode #4-a. I found myself removing the seeds from the cantaloupe until I realize that this is silly. Episode #5. Both traps are triggered, but the cantaloupe is still inside them. Chipmunks? 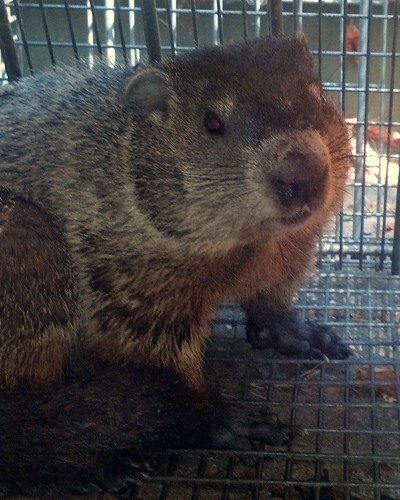 A lead-footed groundhog? We are not sure. Episode #6. Arriving home in the early morning a groundhog is seen sunning himself on the driveway. He runs when we approach and we can’t help noticing that he is obese. He is also fairly slow. Will he even fit inside the trap opening? This is debated. He runs into the bushes. Episode #6-a. We decide that our obvious next step should be to research cute animal pictures and funny videos on the Internet. We discover that certain dog breeds are very good at killing groundhogs. Terriers are excellent but reportedly they are hard to live with. We discover that the Blackmouth Cur (pictured below) is both an excellent pet and also a great groundhog chaser. Coincidentally, we meet a neighbor with a Mountain Cur (a related breed). The neighbor confirms that his dog really likes to catch and kill raccoons, groundhogs, and even squirrels (!). We leap into action and look at a lot more cute animal pictures on the Internet. Episode #8. One trap is triggered and cantaloupe is gone. Victory groundhog. Episode #9. The cantaloupe in the second trap lures a swarm of angry yellow-jackets, which we discover when they sting the radon guy. He says he “doesn’t mind.” We doubt this. Episode #10. The first trap is triggered a few more times but the cantaloupe is not removed. So close! Episode #11. The second trap’s cantaloupe is now covered in swarming ants. They fight the yellow jackets. We decide to never touch this trap again. Episode #12. We call Critter Control and the very nice man comes out and agrees with our overall strategy. He puts down two larger traps in addition to our two traps. He baits his with apples and he puts them directly adjacent to the groundhog hole. Episode #13. Finally! Just a few hours later, we meet the previous resident of our property. Episode #13-b. Thomasson has a lot of B.O. This entry was posted on Friday, August 24th, 2012 at 9:06 am	and is filed under Groundhogs, Living.